Eduardo De Santis was the Founder & Chairman of Gold Mercury International. Through the Gold Mercury Awards, research and summits, Eduardo brought together key global governance actors to discuss and debate critical global and sustainable development challenges. His practical approach allowed him to foster international trade relations, advance the development agenda and improve understanding amongst nations. Eduardo researched the few and impractical ‘future seeking’ tools available to leaders and organisations and pioneered new areas: Corporate Vision™ and Visionary Governance™ to assist in the critical development of long-term sustainable global governance, vision and strategy. As an advisor to corporations, governments and international organisations his project experience included: Alcatel, Alitalia, Bank of America, Banamex, Disney, Iberia Airlines and San Miguel Corporation, Coca Cola, Iberdrola, la Caixa, Wells Fargo, Bank of America, Cepsa and Prisa to name a few. During his extensive advisory career he was President International of Landor Associates (now part of WPP Group). Eduardo joined the international film industry as a writer and actor before developing his private film production company working on over one hundred productions in Europe and the United States. Eduardo also participated in the birth of the San Sebastian Film Festival, as well as the Cinema Festival for Children of Gijon and the Cinema Festival of Human Values. 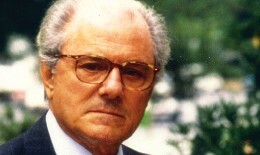 Eduardo De Santis is a ‘Commendatore della Republica Italiana’ and recipient of the ‘Stella D’Italia’, by Italian President Napolitano, one of Italy’s highest honors.